In the eras of our history where conformity has been the undercurrent of success, social acceptance and influence, what goes unspoken often holds more power than what is said. In the absence of words, people will choose to see what they need to see. In Carol (2015), a film of few words, we are voyeurs into the immeasurable emotion of the glance, fleeting touch and longing silence. Director Todd Haynes shows us the developing relationship of Therese Belivet (Rooney Mara) and Carol Aird (Cate Blanchett) in 1950s New York through the fishbowl, a vulnerable place open to public view and criticism. In their every movement, word and touch, the women remain on guard, keenly aware they are being watched and judged on a blurred line of what is acceptable interaction between two women who have just met, and what is not. What is captivating about the relationships in this film is what is said without any dialogue, accomplished through cinematography and the actor’s physical undertones and body language. All of the actors deliver a strong performance. Therese, a department store clerk living an unfulfilled urban life, dreams of more than the man (Jake Lacy) “who would like me to marry him,” while she “barely even know(s) what to order for lunch.” The men of Therese’s world assume it is every woman’s goal to marry – as she is not the sleep-around type that makes her the marrying type. 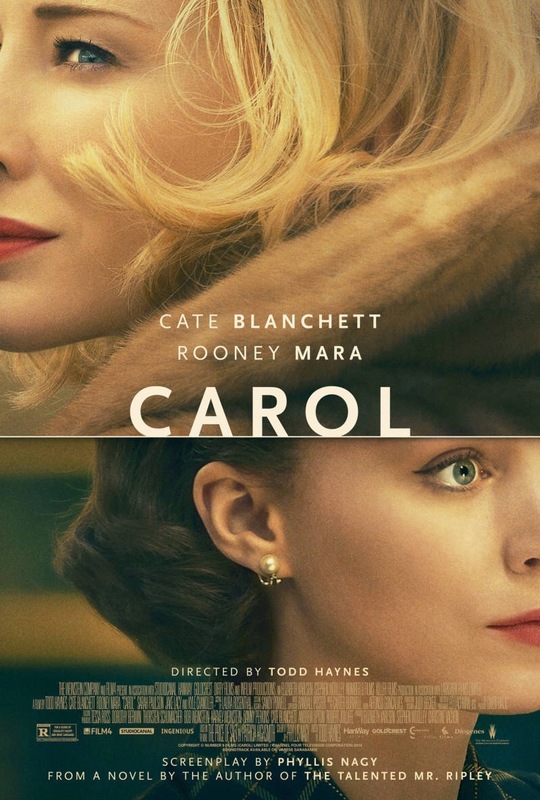 Therese is drawn to the sophisticated and wealthy older woman Carol who is divorcing her husband (Kyle Chandler). He has grown tired of competing with her string of relationships with women, especially lifelong friend Abby (Sarah Paulson). Edward Lachman’s cinematography gorgeously captures the emotional tension and heavy presence of every movement and touch as witnessed through off-center shots through windows – the windows of shops, restaurants, cars, houses and motels, speckled, distorted and blurred by the moisture of rain, snow and ice. The camera draws soft focus circles around Therese’s innocent entrance into her first romantic relationship with a woman. Mara is earnest, relatable and endearing as Therese, tentative and unsure about where her relationship with Carol is going, reading the signs, but not trusting what they tell her. Blanchett plays Carol as confident and worldly, almost smug about her ongoing divergent relationships with women, until her “angel flung out of space” causes her to pause and come to terms with whether she is leading a genuine life. Their involvement compels Carol to make choices about the custody of her daughter, confront and put words to her feelings for Therese, and most significantly forge an honest relationship with herself. Nominated for 5 Golden Globes, Carol premiered at Cannes International Festival to rave reviews and won Best Actress for Mara. Haynes’ career as a director has focused on the stories of musical legends and gay themes, beginning with his controversial short film in 1988, Superstar: The Karen Carpenter Story, which used dolls instead of actors to tell the story of the late pop singer. His 2002 film Far from Heaven (2002), about a 1950s Connecticut housewife who discovers that her husband is gay (Julianne Moore, Dennis Quaid), brought Haynes mainstream recognition through critical and box office success. Blanchett received an Academy Award nomination in Hayne’s 2007 film I’m Not There in a cross-gender role as Jude, one of 7 fictional characters telling the life Bob Dylan. Great review! It makes me want to see the film. Great review! I had no interest in seeing this film until I read this very well written review.